This is real neat and sure to sell out fast ! These coins are being issued in recognition and celebration of the National Baseball Hall of Fame, which celebrates its 75th anniversary in 2014. The National Baseball Hall of Fame Coins are scheduled to go on sale in early 2014. 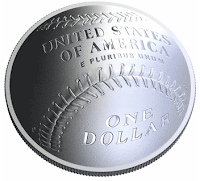 The winning design, submitted by, Cassie McFarland was selected from the finalists by the Department of the Treasury on September 4, 2013, after consultation with the National Baseball Hall of Fame and U.S. Commission of Fine Arts and review by the Citizens Coinage Advisory Committee.